I love the sweet, sassy, and infectious sound of this unique island music. This weekend, Nov. 18-19, is the fifth annual Fungi Fest in the BVI. I am a bone fide fungi fiend, so in honor of the upcoming event I am sharing the following from Moon Virgin Islands. An artist’s illustration of a quelbe, or fungi, band. Artwork was used by the Reichold Center on St. Thomas to promote a quelbe extravaganza it produced in 2009. “The traditional music form of the Virgin Islands is quelbe music, also called scratch or fungi. A quelbe band consists of a banjo, conga drum, squash, and a triangle. Other instruments sometimes include guitar, bass, saxophone, or flute. Quelbe musicians use objects close at hand to construct their instruments, although today some have adopted more modern instruments. The banjo was often made out of an old sardine can. The squash was a dried local gourd, serrated and then scratched with a comb or wire-pronged stick. The base line was usually provided by someone blowing into the discarded tailpipe from a car. “Quelbe music developed on sugar plantations, where slaves used materials at hand to provide a rhythm and melody to which they could tell stories, share jokes, and spread gossip. The music was influenced by African rhythms and the sound of Danish and British military bands. After slavery ended, quelbe music grew in popularity as the restrictions of slavery ended and the music form could spread freely. 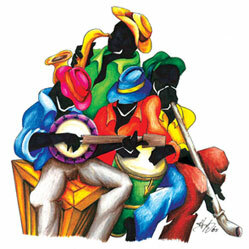 Many older Virgin Islanders have sweet memories of nights spent dancing to the sound of their village quelbe band. “Quelbe music still tells stories and jokes, often with a risque undertone. Quelbe is especially popular at Christmastime, giving a new and refreshing take on Christmas music. Traditionally, quelbe bands would go serenading in the wee hours of Christmas morning, wishing their neighbors a merry Christmas. “Today, quelbe music is being preserved by a handful of bands. In the British Virgin Islands, the Lashing Dogs and Loverboys perform fungi music (as it is called there) at bars and festivals. In the U.S. Virgin Islands, Jamesie and the Allstars, Stanley the Ten Sleepless Nights, Bully and the Kafooners, and Blinky and the Roadmasters carry on the tradition. Jamesie Brewster, the leader of Jamesie and the Allstars, is the subject of a forthcoming documentary. You can hear a snippet of his music at www.jamesieproject.com.